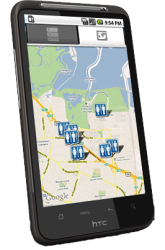 We just released the beta of our restroom finder app “GoToilet” and moved it into the market for android smartphones. Using GoToilet you can easily find bathrooms close to you. This includes public toilets as well as restrooms in restaurants and other facilities. Our database contains more than 390,000 restrooms worldwide. We kindly ask for your feedback!